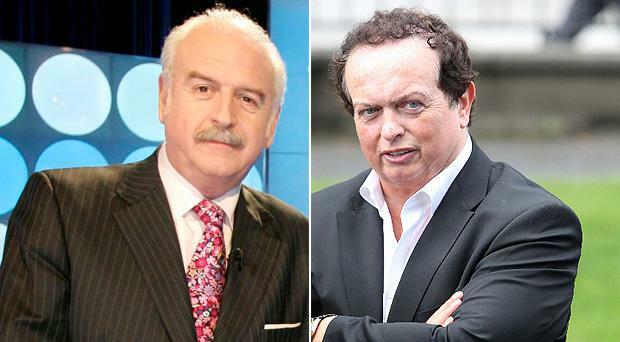 Is young gun Marty Morrissey (53) to replace old fogey Marty Whelan (57) on Winning Streak? RTE has confirmed that popular GAA presenter Marty Morrissey has fronted a pilot for a new Winning Streak. However, it insists it has made no decision on whether Marty Whelan could be replaced by his younger sporting namesake Morrissey – who is just 53. Whelan (57) – who recently had a hair transplant to improve his image for TV – was not involved in the technical run-through for the new show. RTE said Marty Morrissey fronted the technical run-through in Donnybroook studios last Saturday – to explore new games and formats for the show. Morrissey is seen as a hit with younger viewers for his wit and jolly nature. “We’re looking at options to renew Winning Streak and to trial new games and new formats,” a spokesperson confirmed this morning. Whelan has presented Winning Streak since 2009. Last year, RTE bosses axed Geri Maye (40) from the show and replaced her with Sinead Kennedy. The spokesperson confirmed that no decision has been made as to who will eventually take the helm on the new show. Marty Whelan currently hosts RTE Lyric FM’s Marty in the Morning show, where he’s known for his soft and cheery banter. In 2004, his afternoon chatshow Open House was scrapped by RTE and in another blow, he lost his high-profile 2FM breakfast show slot in 2007. Meanwhile, RTE’s spokesperson said the axing of the Big Money Game Show was a separate decision taken by the National Lottery. However RTE's Head of Entertainment, John McHugh said: “It’s not unusual for TV teams to explore options on current shows. "Last week’s session in studio was simply a technical run through to trial some new games. People are jumping to conclusions and the reports today are just simply speculation. "Marty and Sinead are absolute pros and doing a fantastic job on Winning Streak. Sorcha O'Connor Jennifer Zamparelli has been confirmed as the new host for Dancing With the Stars. Liam Devally, who died in Dublin last week at the age of 85, was a singer, quiz show host and broadcaster who switched in mid-life to become a barrister and later a judge of the Circuit Court, where he adopted a no-nonsense approach to both litigants and members of his own profession. John Hillerman, who has died aged 84, played one of the most joyous creations of 1980s popular American television: Higgins, the prissy English major-domo who was the foil to Tom Selleck's eponymous private eye in Magnum, PI.